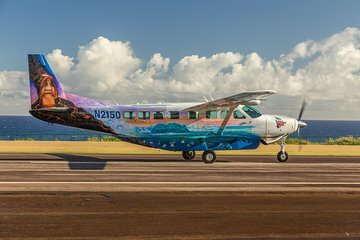 Watch night fall over the Pacific on a 2-hour sunset air tour of the Big Island, and explore steaming calderas, rainforests and Hawaii’s rugged coast. Leave Kona in a Cessna plane and soar above the Hawaii Volcanos National Park; see Kilauea’s lava flows glow in the dusky light as you enjoy your pilot’s commentary on the island’s landmarks and history. Capture unforgettable images through the plane’s viewing windows, glide over the coast’s beaches and surf breaks then catch the night’s first stars as you touch back down in Kona. 2 thumbs up to Captain Daryl and the team at Big Island Air. Grateful that they still honored the tour even though there was only 1 other passenger besides me and my mom. Even if it were a full group, every seat gets their own window - no middle seat problem as you would have in a helicopter. 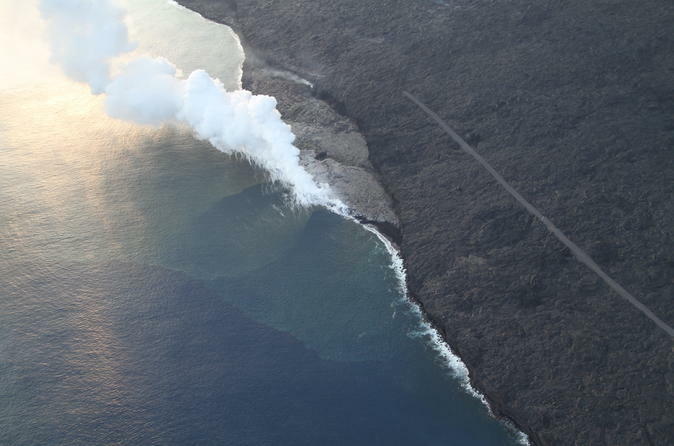 And when we reached the main attraction where the lava meets the ocean, Captain Daryl circled in close and tight making sure we got to see the show.